The Bible never claims to be the Word of God; nevertheless, multiplied thousands of honest-hearted believers insist that the Bible is the Word of God. So,"What is the Word of God?" 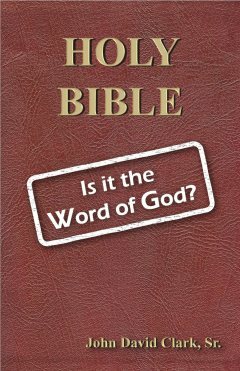 Right click here to download the pdf version of "Is the Bible the Word of God?". Visit our Bible topic page for more study materials about the Bible. The Bible never claims to be the Word of God; nevertheless, multiplied thousands of honest-hearted believers insist that the Bible is the Word of God. Among some zealous believers, and not-so-zealous believers, confession of faith in the Bible as being the Word of God has, in fact, become a litmus test to prove the legitimacy of one�s faith in Christ. But God never set that standard for us, and it is dangerous to use anything as a measuring stick that He has not set forth for that purpose. In this book, I hope to demonstrate beyond all doubt that it is unbiblical to refer to the Bible as God�s Word. Not only is it unbiblical to do so, however; it is also unwise, as I hope to show. There will be hundreds of biblical verses offered in evidence of these statements, but this book will not be all work and no play. A bone-dry playground can cause nasty scrapes. So, I will water down this work with a section filled with good-natured humor in which I carry the notion that the Bible is the Word of God to its logical limits. I pray that in doing so, I do not offend my Readers, regardless of their doctrinal persuasion. I respect every believer�s privilege to believe what he will, and I do not seek to demean but to persuade. As much reverence as is due the Bible, however (and it is due a great deal of reverence), it is beyond the limit of both reason and revelation to call it the Word of God. That �the Word was in the beginning with God� does not suggest that during Creation God had a Bible sitting on a table beside His heavenly throne. And that �the Word became flesh and dwelled among us� does not mean, as one man told me, that the Bible became a printed book on earth. Rather, that �the word became flesh� extols the wonderful love of God in sending His Son to dwell among us, the Word of the Father incarnate.